They were warned, they were doomed, but nothing can save them from Jason. Fridays will never be the same again in this chilling Jason costume from the 1980's classic Friday the 13th. 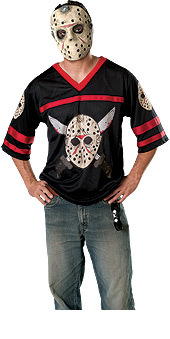 This Jason Hockey shirt was made famous on a summer camp, and the movie will forever be a Halloween or friday night classic. Wear this Jason costume to your next themed or Halloween party!